King Lear follows the title character as he attempts to divide his kingdom among his three daughters. 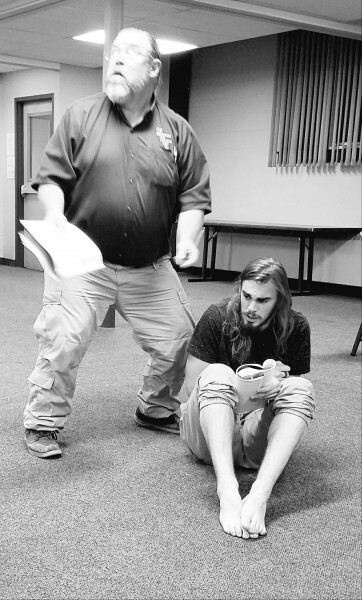 The Pigeon Creek Shakespeare Company presents two weekends of Shakespeare's King Lear. The Pigeon Creek Shakespeare Company will present Shakespeare's King Lear November 10, 11, 17, and 18 at 8 p.m., and November 12 and 19 at 3:00 p.m., at the Dog Story Theater, 7 Jefferson SE in Grand Rapids. King Lear follows the title character as he attempts to divide his kingdom among his three daughters. After he banishes his youngest daughter for failing to make a large enough public demonstration of her love for him, Lear discovers that his two older daughters have no plans to care for him in his old age as he had hoped. This family drama plays out on an epic scale, with political rivalries, power struggles, and an invading army. Actor Scott Wright appears as King Lear, and is joined in the cast by Kate Bode, Kimberlee Griggs, Kat Hermes, Maggie Hinckley, Scott Lange, Micah Mabey, Eric Orive, Tony Peraino, Sarah Stark, Kate Tubbs, and Riley VanEss. The production is directed by Pigeon Creek executive director Katherine Mayberry. Tickets are $14 for adults, and $8 for students and seniors. They are available at www.dogstorytheater.com. Information about other venues and upcoming productions by the Pigeon Creek Shakespeare Company is available at www.pcshakespeare.com.